Is it possible to fully protect your name in the digital age? As a Realtor, if you aren’t protecting your business’s name, it can be used competitively against you. This week gave us a poignant reminder of the potential. It was also an opportunity to prepare ourselves for more competition and the Realtors code of ethics for the future. The latest hubbub was Zillow using real estate businesses’ names in pay-per-click ads. A couple of agents just stumbled upon the ads. 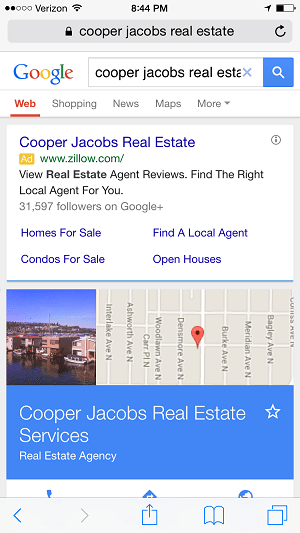 When a consumer searched Google for a company’s name (ex: Cooper Jacobs real estate), Zillow had an ad placed at the top of the page. The first link’s text had the company’s name and was supposed to go to that agent’s profile page on Zillow. The next four links in the ad went to “Homes for Sale,” “Condos for Sale,” “Find a Local Agent” and “Open Houses” — none of which landed the user on anything related to the company’s name that was advertised. There were plenty of opinions as to the intent, strategy and propriety of the program. In this case, the net effect was that Cooper Jacobs would lose significant traffic if the ad continued to run. Courtney Cooper is a friend and competitor (more on that later). She has almost every link on the first page of search results for her company going to one of her curated websites and review platforms. Zillow’s ad bumped those down and inserted four links that diverted traffic away from her business. Competitively, it was a good move. To the premier agent in the ad who likes the company and vocally supported it for years, it was ham-handed at best. The ads are currently on hold. There are two distinct learning opportunities from this episode. The first is regarding unrestrained competitors, and the second pertains to those that we cooperate with in a standardized fashion. Business is business. Someone else will probably try to use your name against you in the future. Zillow has temporarily paused the ads because its revenue source (agents) squawked at the practice, but even if they never run them again, another company probably will. For-profit companies will run ads against you the moment the return on investment is positive. It’s what investors demand. Businesses can combat this by paying for their own PPC (pay-per-click) campaign on their company names. It’s inexpensive, but it’s also a hassle most probably think they shouldn’t have to handle. In reality, it might be necessary. Companies can also register their business name as a trademark — it might not prevent competitors from using it in their ads (see previously mentioned ad), but it does provide some immediate ammo to ask an advertiser to take down an offending ad. Google also has a trademark complaint form that might help in stopping an ad using your trademark. We’ve followed tech companies building ads, ratings, rankings and online profiles of real estate agents over the past few years, and it’s clear that there’s very little concern about using your name competitively against you. Asking forgiveness is preferable to permission, so it’s called a “test” or a “beta version.” But that’s just marketing if it’s live on the Web. Getting past the unrestrained competition, we also have competitors within our real estate world. Realtors’ interactions with one another are governed by a code of ethics. It speaks specifically to the need for us to present a true picture in advertising, without misleading consumers. Its overall tone would lead one to believe that an ad similar to Zillow’s, but placed by one Realtor versus another, would be a violation of the code. Clearly, most of that ad was designed to take traffic away from the company whose name was being advertised. The great value in the code of ethics is specificity. Standards of practice are included to help Realtors abide by the code in their daily routines and help boards make concrete decisions on violations. A twist on the Zillow ads might call for an update of Standard of Practice 12-10 to help those boards clearly define proper use of AdWords and search engine ads for members. This standard of practice would probably prohibit one Realtor from placing an ad like Zillow’s, advertising another Realtor’s name in the ad and using it to divert Internet traffic in a misleading way. What if Realtor A simply bought Realtor B’s name as a search term, though, and then placed a standard, truthful ad about Realtor A every time a consumer searched for the Realtor B’s name? Would purchasing the AdWord “Realtor B” itself constitute manipulation or misleading results? Realtor B would probably think so. Ethics violations have been filed for much less. It could be argued, though, that the practice is the same as Realtor A asking the Yellow Pages to place an ad for his company next to every instance where Realtor B is displayed. If the ad itself is truthful, is advertising specifically targeted to be close to a competitor’s name just a strategic tactic? That’s what PPC advertising at its core is — proximity targeting. Whatever the right answer is, it should be defined in the code. Clarity can reduce violations of the code and shorten deliberation over perceived violations. PPC advertising isn’t new, but it’s evolving and growing quickly. For our members, we should have a clear guide as to its ethical use. I won’t be running an ad based on Courtney’s name anytime soon, nor do I expect she will with mine. We compete every day for the top search engine results in our market. We do so with a healthy level of competitive respect. Still, it would be helpful if we had a bit more clarity in our Realtors’ code so that all of our competitors know which side of the code they are on if they decide to use our names in their AdWord campaigns. Fences make good neighbors. Sam DeBord is managing broker of Seattle Homes Group with Coldwell Banker Danforth and a director for Washington Realtors and Seattle King County Realtors. You can find his team at SeattleHome.com and SeattleCondo.com. For sale by Zillow: Should you be worried?